I’m obsessed with markets. They show what a place is made of. What they sell, what people buy tell the story of a culture. Looking back at the hugely differing markets of India and Korea, Greek markets are yet another world away. Markets expose the heart, the land and the people of a culture. The interaction of the locals reflect local customs. In Greece, people are loud and direct, they say what they mean and mean what they say, and they do it with one hand posted on their hip and the other flying through the air. The public market is busy, with a mix of a quick-moving, get in get out crowd, and leisure tourists and weekend warriors taking it all in. A step through the tall, inviting arches opens up to high ceilings of the breezy building and the eye is immediately met with generations of tough butchers running the meat department. They are the most aggressive of the market vendors in their sales tactics. Shameless catcalling from the younger males along side pitching sales makes for an obvious double entendre of the term meat market. Suited up in clean, white coats with swift, deliberate swings of their cleavers, they slam down onto thick, freestanding wood blocks as they break down whole animals on the spot. Lamb, beef and pork dominate. The seafood section greets with pungent smells of oily fish and wet, slippery ground, as if the room has been lifted right out the sea by a giant strainer and set inside the concrete room. Loud vendors shout prices and customers negotiate. Metallic silver scales are displayed beautifully with parsley and lemon decoration. Across the street in an open air square, umbrellas and awnings shade large, ripe, color-rich fruits and vegetables. 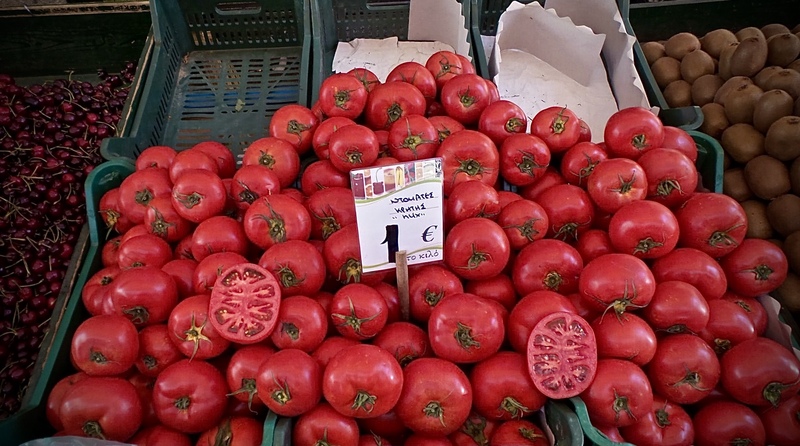 It’s summer in Athens and if they heat isn’t a dead giveaway the plethora of perfect stone fruit, berries, cherries, watermelon, citrus, deep red tomatoes, bright green cucumber and aromatic herbs is all telling. The smell of sweet fruits leaks into the air and lingers potently. More than once, I would stop, close my eyes, and just breath deeply. Nuts and dried fruits by the heaps and every shade of green, brown, and black are represented in bins full of glossy, shiny olives. Fridges are filled with stark, white blocks of cheese and tubs of yogurt. Pita and baked breads are piled as high as possible. There is no better way to sop up olive oil and feta soaked meals the Greeks do so well.